As an executive, you are responsible for overseeing the operations of a large part of an organization, while also making sure that your employees have the tools and resources they need to be successful and keep processes moving seamlessly. Visibility: You don’t have time to sift through reports and spreadsheets. You need a high-level look at your organization. An RPA solution offers just that – simple dashboards that allow you to drill in to certain reports if you so choose, or utilize the higher-level overview for a snapshot of what’s going on. Accountability: When procedures are streamlined and automated, you can rest assured that things are handled and that employees are managing the tasks that they are responsible for. Competitive Edge: By improving your technology investments, you are making sure that you can bring products to market faster, improve customer service, improve vendor relations and operate more productively and strategically, keeping you in front of your competition. ROI: An automated document management solution cuts the cost of paper-based and manual processing by eliminating printing and paper storage costs. It also increases efficiency and visibility, allowing employees to work better and more strategically and allowing managers to reallocate employee time to more pertinent tasks. Shed some much-needed light on your financial processes. 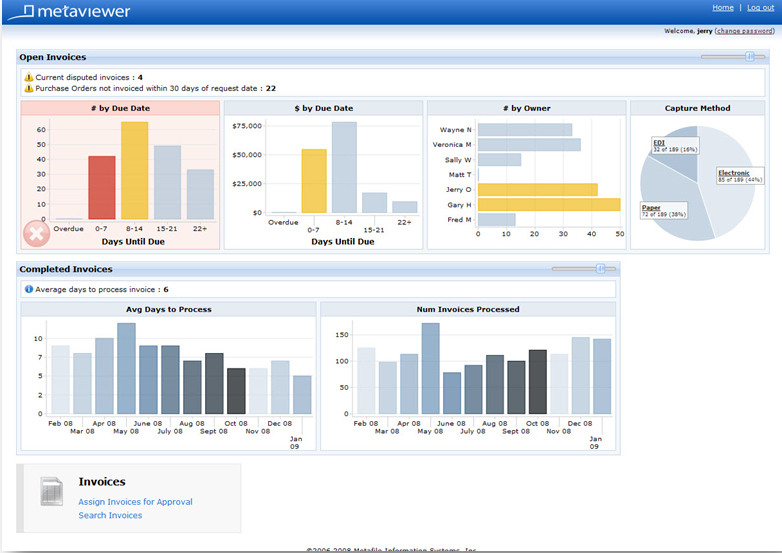 MetaViewer tracks every step of every transaction, giving you a complete picture of your entire AP process. Real-time dashboards and color-changing charts give a snapshot of delays and alert you of problem areas and upcoming due dates. See a running invoice total that tracks your spend requirements for the next day, week or month. Simply click on any portion of the charts or graphs to drill down to the actual invoices represented. Now THAT is full visibility. Real-time and long-term views of your financial processes like never before. Control and visibility over the entire lifecycle of your company’s transactions. MetaViewer provides you with the document and data capture, workflows, integration with your ERP, real-time charts, graphs, and stats to eliminate the blind spots and bottlenecks created by paper-based procedures. You will instantly know which vendors are under-performing, where slow-downs are occurring, and what amount of spend is in the invoice approval process. Why limit your MetaViewer solution to just one department? Our solution easily expands from AP to AR, HR, Legal and any other department that processes crazy amounts of paper so you can pitch the paperclips across your entire enterprise.